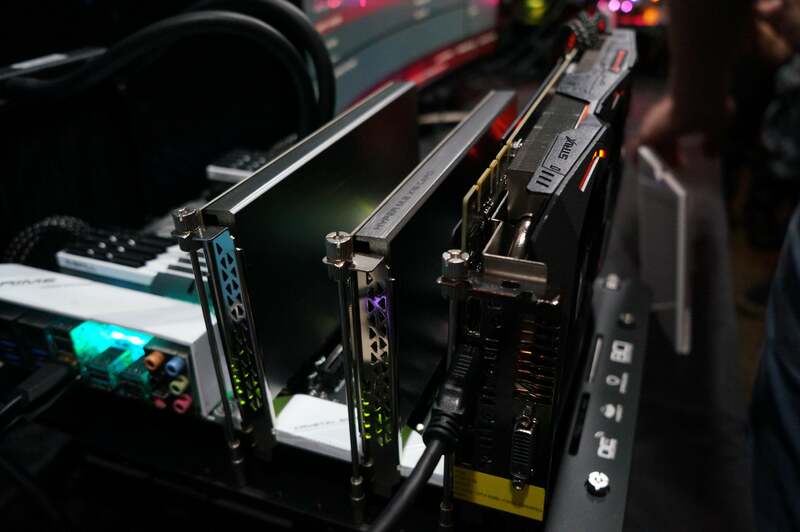 Here's what eight SSDs in RAID 0 looks like on the new Core i9 platform. Storage buffs will get a massive dose of fun when Intel’s X299 chipset launches. The new Core i9 chipset will support up to 20 devices in a bootable RAID partition. 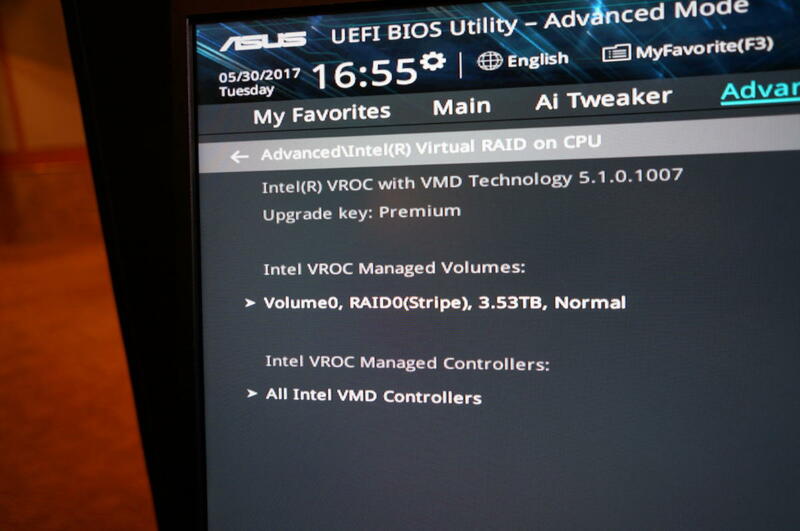 The overlooked featured is called Virtual RAID On CPU (VROC). We got taste of it courtesy of Asus, which showed the feature running in its new X299 motherboards using a 10-core Skylake-X CPU. 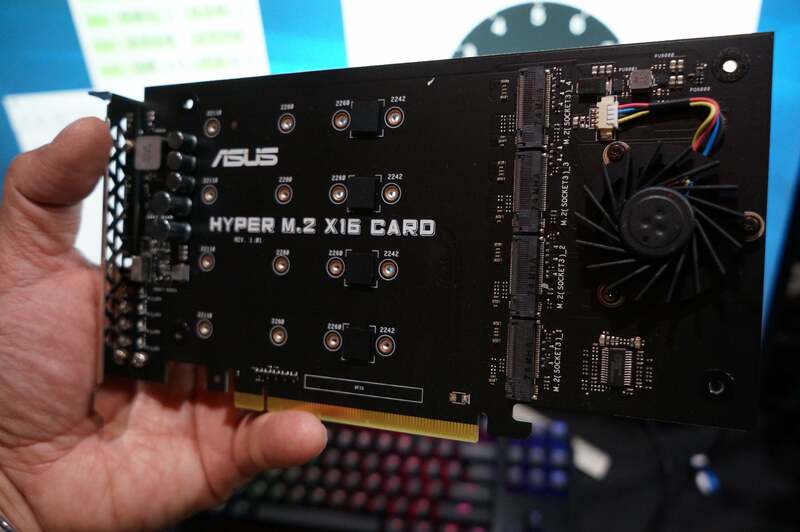 Few motherboards support more than three M.2 slots, so Asus used its new Hyper M.2 PCIe card. The Hyper M.2 lets you load up to four M.2 NVME PCIe drives into a single x16 card. You don’t have to worry about heat, because the Hyper M.2 features a beefy heat sink, thermal pads, and an active fan. If you populated the Hyper M.2 with four drives and dropped it into a slot even on an older motherboard, it would work, but all you would see is four individual M.2 drives. What’s new is the ability to RAID it. All you have to do is boot into the board’s BIOS and enable Intel’s VROC feature. You enable VROC simply by going into the Hyper M.2 PCIe card's BIOS. Once you’ve done that you can see your drives. 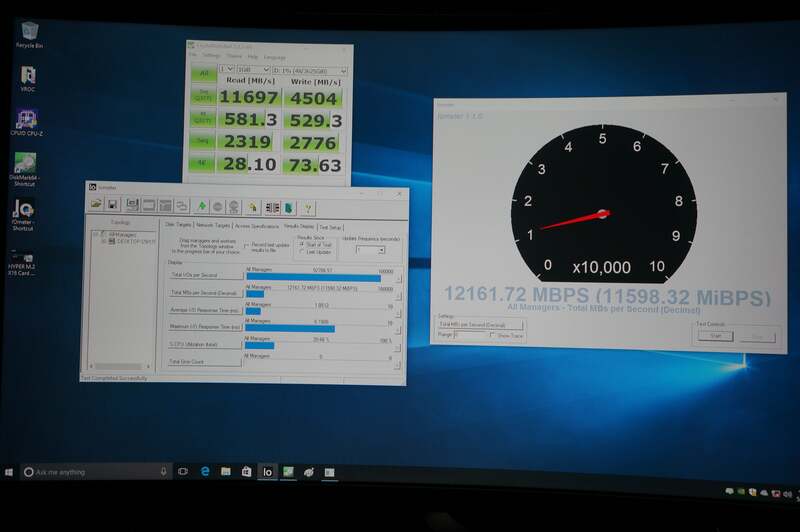 For this demonstration, Asus used eight Intel M.2 600P SSDs. The VROC demo used eight Intel 512GB SSDs. But wait, you say, you can only put four drives into the Hyper M.2 card—how did we do eight drives? Just use two Hyper M.2 drives. As Coach Madden says: Boom. And yes, you can build a RAID with two Hyper M.2 cards. For a quick performance run, Asus used the industry-standard Iometer test as well as Crystal Disk Mark. Below is what it looks like to have a bootable Windows partition with eight M.2 drives. With eight Intel SSDs, this Asus X299 motherboard can hit 12GBps of transfer speed. Yes, that’s 12GBps. What’s crazy is that it’s nowhere close to the maximum that VROC supports. With 20 devices, Intel says it can, in theory, hit 128GBps. Asus officials say right now they’re seeing as high as 13GBps, and they thinks there’s more performance to be wrung out of VROC as it matures. 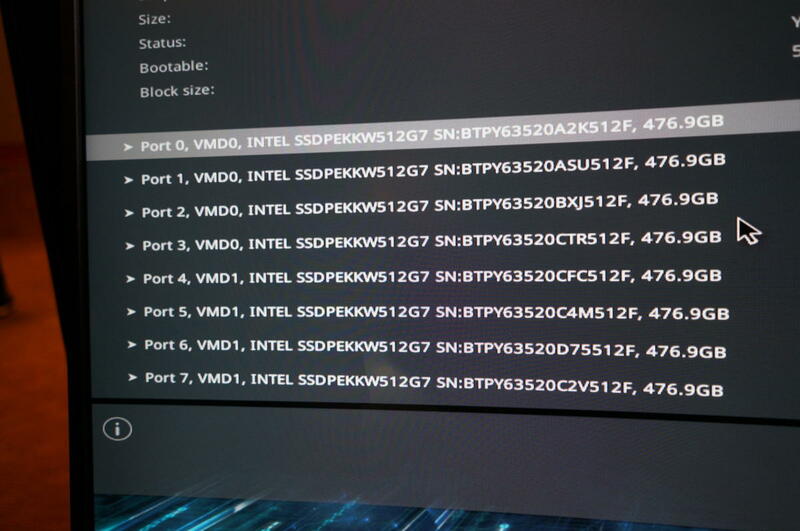 There’s always a catch, and with Intel’s VROC there’s actually multiple catches. The Asus Hyper M.2 card works perfectly fine with, say, a Samsung 960 Pro, and you could see four individual Samsung drives in RAID. If you want to use VROC to create a bootable partition, though, you can use only Intel SSDs. Here's another catch: X299 will launch with Kaby Lake-X and Skylake-X CPUs, but Intel VROC will work only with Skylake-X. Intel’s Virtual RAID On CPU supports up to 20 drives in RAID 0 for free, but if you want more RAID 1 or other redundant setups, you need to buy this key from Intel. No, we’re not making this up. 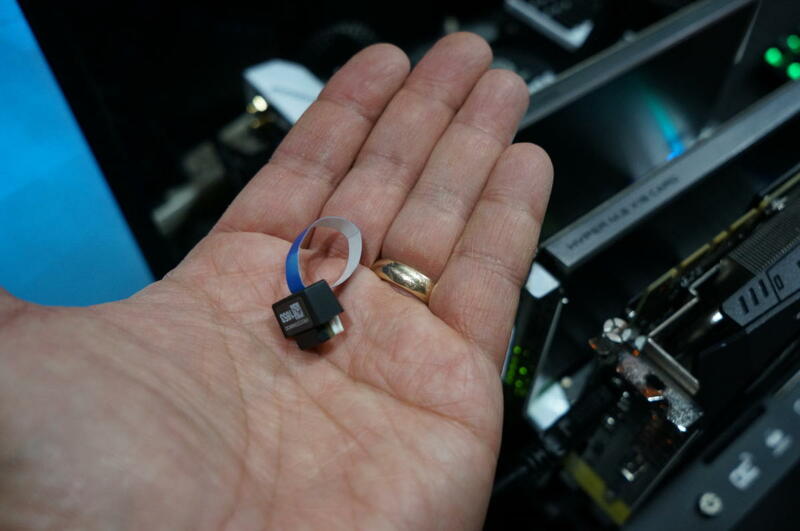 That little dongle is a key that Intel will sell to consumers. Out of the box, if you have Intel drives, an Asus Hyper M.2, and a Skylake-X, you can build a RAID 0 partition. But if you want to enable RAID 1, RAID 5, or other RAID schemes with redundancy to protect your data, you have to buy this Intel key to enable it. If you scroll back to the first BIOS shot, you can see the “premium” mode is enabled, which means it supports the premium RAID support. How much? No one seems to know. So why would Intel put all this work into a feature and then add a surcharge which could kill its adoption? Intel officials weren’t on hand to say, but the surcharge is related to the enterprise underpinnings of the Core i9 and X299 platform, where the feature is an up-sell. Intel can’t sell it to one customer and give it away to another, can they?